Alright kids, I have been busy and can now present you with two new patterns! Pattern number one the brand new snake scarf pattern! The second pattern is a total rework of a previous one. I took my most popular pattern, the viking hat, and completely renewed it. The pattern is now easier and faster to work AND it comes in 9 sizes! From newborn to XL adult, you can now clothe your whole family in viking gear! All customers who have previously bought the viking hat pattern will receive a complementary updated version. If you bought through Craftsy or Ravelry, you will have received an email already. If you bought through Etsy however, you will get the new pattern in an email within the next few days. Unfortunately Etsy does not offer auto-updates like Ravelry and Craftsy do, which means I have to manually go through all orders to find and email all previous customers. If you have not bought the viking hat pattern yet, you can do so here: on Ravelry, on Craftsy, on Etsy. The winner of my viking hat give-away has been picked! Congratulations to Emily G. from California! Her hat will be made next week after I finish the desert dragon I am working on at the moment. I am also getting ready to publish my dragon scarf pattern. It will be released in the next few days. And last but not least, there are more dragons available in my shop! 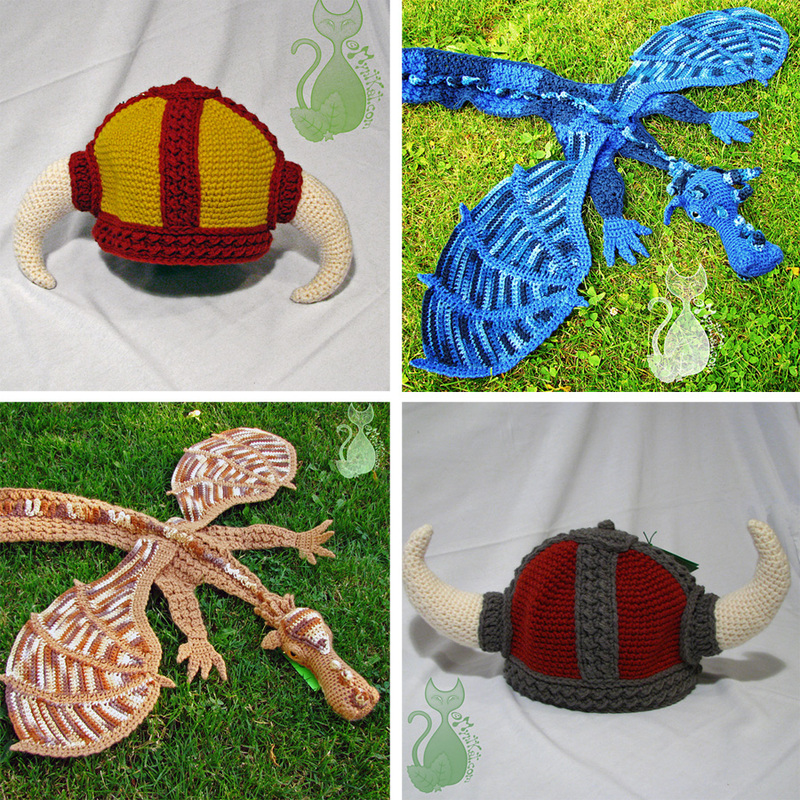 We have reached 100 viking hat pattern sales! To celebrate, MyntKat Creations is giving away one handmade crochet viking hat to one lucky winner! I have released my Viking Hat pattern on Ravelry and Etsy!